Columbia River 2852 CRKT 2852 OC3 FREE SHIPPING! 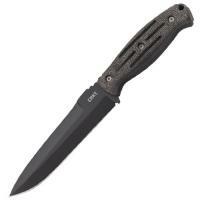 The Columbia River CRKT 2852 OC3 is a deadly fixed blade tactical knife designed to take on all comers in close quarters combat. Its six-inch double-edged blade is brutally effective, delivering extreme penetrating power and slicing ability for high performance both in combat and for utility use. Its black powder coating resists corrosion and reduces wear for a longer-lasting blade. The handle is made from resin-infused fiber, with a textured surface that provides a secure grip under all conditions. The knife comes with its own nylon and glass fiber sheath that protects it between uses and includes a gear clip for portability. ©2002-2019 CopsPlus.com: Columbia River 2852 CRKT 2852 OC3 FREE SHIPPING!